General: The overall appearance of the ideal Siberian cat is one of great strength and power modified by a seet facial expression. The general impression of a Siberian cat's body type is one of circles and curves rather than the rectangles and triangles of some similar breeds. Siberian Males may be considerably larger than Siberian females. The Siberian cat breed is extremely slow to reach maturioty, taking as long as five years, and allowance should be made for this fact when comparing younger cats to the standard. Head: The Siberian cat's head is a wedge that is medium in size and is modified by full, rounded contours. The Siberian cat's head is broader at the top of the skull and narrows lightly into a full, short, rounded muzzle is gentle and inconspicuous; however, a slight outward curvature at the muzzle is allowed. The cheekbones are smooth and unobtrusive. Viewed in profile, the forehead forms a flate plane. The line from the forehead down the bridge of the nose is a gradual slope. There is a slightly concave curve just before the tip of the nose. 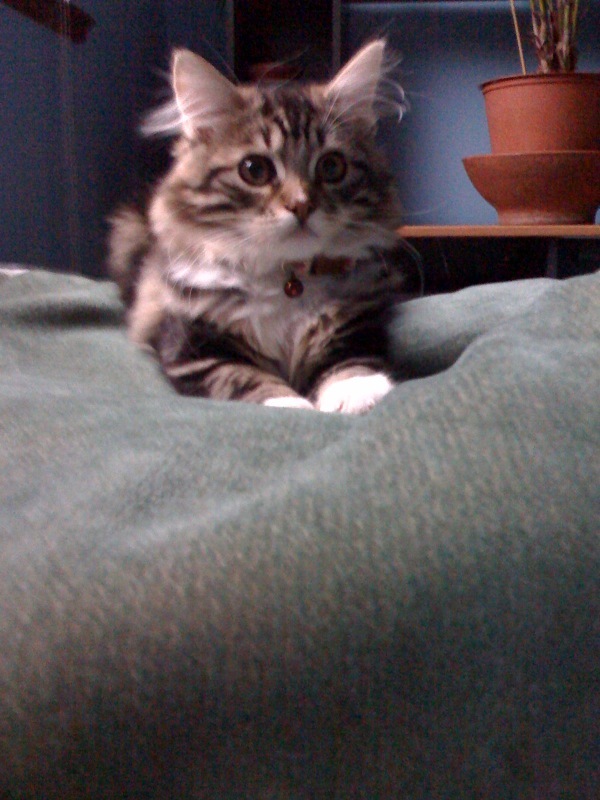 Ears: The Siberian cat's ears are medium; wide and open at the base and are set down slightly on the sides of the head. Ideally positioned, the Siberian cat's ears are slightly more than one ear's width apart. The Siberian cat's ears are tilted forward. The tips are rounded, but lynx tipping is allowable. The hair on the back of the ears is shorter and sparser than at the tips; yet, from the middle of the ear to the base, furnishings become longer and may entirely conceal the base of the ear. Eyes: The Siberian cat's eyes are large, almost round eyes, and expressive. They are slightly than one eye's width apart with the outer corner angled slightly toward the lower base of the ear. Acceptable Siberian cat's eye color may cover the entire green-gold spectrum. Typical adult color is yellow-green. Richness and depth of color are desirable. Body: The Siberian cat's body is medium in lenth and muscular in build. It has substantial weight when lifted. The back is arched slightly higher than the shoulders. The rump is smooth and round. The torso and belly are firm and barrel-shaped. Tail: Wide at base; blunt tip. The Siberian cat's tail length is somewhat shorter than the length of the body without upsetting the overal good balance desired. Legs and Feet: Medium in length; bones and sturdy without cobbiness. The hind legs are slightly longer than the front legs. The feet are large and round. Toe tufts are desirable. Coat: Texture may vary due to Siberian cat's coat color. The Siberian cat's coat is a triple coat. The fur on the shoulder blades and lower section of the chest is slightly shorter than on the body. The neck has a thick, full ruff. There is a tight undercoat which is thicker in cold weather. Allowance should be made for seasonal variations in coat length and thickness. A wavy coat is not characteristic, but hair on belly and britches may thicken to curls. Color and Markings: All colors and combinations of colors are acceptable with or without white with the exception of pointed, which are not allowed; neither is self-chocolate or self-lilac. In the tabby group, white or off-white is allowable on the chin, breast, and stomach areas. Buttons, spots and lockets are allowable in all colors. Condition: The overall physical appearance of the Siberian cat should be one of great strength, force and size in excellent mental and physical condition. 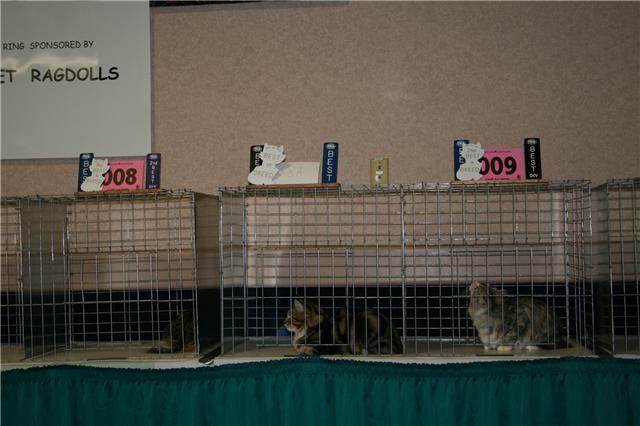 Penalize: Adult Siberian cats not having substantial size and weight. Straight profile; narrow or fox-like muzzle. Non-rounded ears; Almond shaped eyes; very long legs; :Lack of undercoat. Accepted Colors: All colors and patterns. General: the Siberian cat, Russia's native forest cat, first appeared in recorded history around the year 1000 and hails from the unforgiving climate of Siberia. This is a cat that nature designed to survive, with no extremes in type. The Siberian cat is a medium to medium large, strong triple coated cat with surprising heft for its size. The overall appearance should be one of strength, presence, and alertness, with a sweet facial expression. The Siberian cat breed is extremely slow to mature taking as long as 5 years. 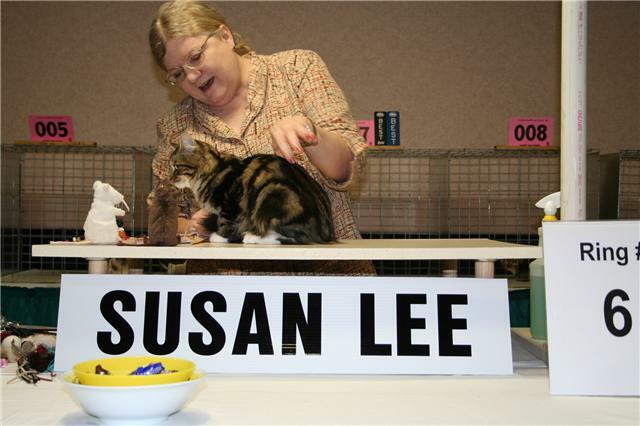 Females are generally smaller than males and allowances should be considered when comparing females and young cats to the standard. Size is secondary to type. The general impression is one of roundness and circles, rather than rectangles and triangles. Head Shape: modified wedge of medium/large size with rounded contours, in good proportion to the body. The Siberian cat's head is broader at the top of the skull and narrows slightly to a full-rounded muzzle. The cheekbones are neither high set nor prominent. There should be a slight doming between the ears and an almost flat area on the forehead. Siberian males will have well developed jowls and Siberian females will have a more moderate look. Ears: medium-large, rounded, wide at the base and tilt slightly forward. The Siberian cat's ears should be set as much on the sides of the head as on top. The hair over the back of the ear is short and thin. From the middle of the ear, the furnishings become longer and cover the base of the ear. Ear tipping is allowed. Eyes: medium to large, almost round. The outer corner angled slightly towards the base of the ear. The Siberian cat's eyes should be set more than one eye's width apart and should be open, alert, and expressive. There is no relationship between Siberian cat's eye color and coat/color pattern except in the color points which have blue eyes. Chin: the Siberian cat's chin is well rounded but not protruding, and is in line with the nose. Muzzle: the Siberian cat's muzzle is moderately short in length, full and rounded. There is a slight muzzle curvature, but the transition between the side of the head and the muzzle is gentle and inconspicuous. Profile: the top of the Siberian Cat's head is almost flat, with a slight nose curvature of a gentle slope from the forehead to the nose and a slight concave curvature before the tip when viewed in profile. Neck: the Siberian cat's neck is rounded, sturdy, and well muscled. Torso: the Siberian cat's body is medium in length, and well muscled with the back arched slightly higher than the shoulders, with a barrel-shaped, firm belly giving the sensation of solid weight. Legs: the Siberian cat's legs are medium in length. The Siberian cat's legs should have substantial boning with the hind legs slightly longer than the front legs. Feet: the Siberian cat's feet are big and rounded, with toe tufts desirable. Tail: the Siberian cat's tail is medium in length, being somewhat shorter than the length of the body. It should be wide at the base, tapering slightly to a blunt tip without thickening or kinks, evenly and thickly furnished. Coat Length: the Siberian cat is a moderately long to longhaired cat with a TRIPLE coat. The hair on the shoulder blades and lower part of the chest should be thick and slightly shorter. There should be an abundant full collar ruff setting off the head in adults. Allow for warm weather coats. The hair may thicken to curls on the belly and britches, but a wavy coat is not characteristic. Coat Texture: varies from coarse to soft, varying according to color. 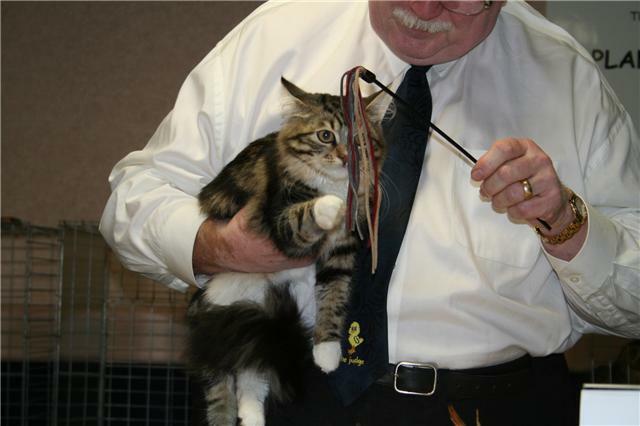 There is a tight undercoat (in mature Siberian cats), thicker in cold weather. Coat Color and Pattern: all colors and combinations are accepted with or without white. White is allowed in any amount and in all areas. White or off-white allowed on chin, breast and stomach of tabbies. Buttons, spots and lockets are allowed. Strong colors and clear patterns are desirable. Penalize: straight profile, narrow or fox-like muzzle, long tail, delicate boning, non-muscular, long body, almond-shaped eyes, and very long legs or very short legs; a Siberian adult with a long body or without good body weight. Disqualifications: kinked tail, incorrect number of toes, crossed eyes. Evidence of illness, poor health, emaciation. General: The Siberian cat's size is medium to large, females mostly smaller then males. Head Shape: The Siberian cat is a little bit longer than broad, softly rounded, massive wiew also drawing forehead broad, just slightly rounded. Cheeks: The Siberian cat's cheekbones well developed, high set. Nose: The Siberian cat's nose is in medium length, broad, in profile shows a slight identation, but without stop. Chin: The Siberian cat's chin is slanting slightly backwards, in profile creating a curve from the upper line of the nose. Ears: The Siberian cat's ears are in medium size, well open at the base, tips are rounded with well developed hairs on the inside and tufts. Placement with good width between, tilting slightly forward. Eyes: Shape/placement large, slightly oval shaped. A bit oblique, set widely apart. Color: uniform, any colour is permitted, but preference is given to green. Body Structure: well boned and muscled, powerful neck, broad chest, body in proportion to create a rectangular appearance. Legs: The Siberian cat's legs are medium high, to form a rectangle with the body, strong. Paws: The Siberian cat's paws are large, round, well tufted between toes. Tail: The Siberian cat's tail is long, thick, rounded tip. Covered on all sides by dense hair with no hairs trailing down. Coat Structure: The Siberian cat's coat is semi-long, well developed, very dense, undercoat not lying flat, overcoat water repellent, slightly hard to touch. Summer coat is distinctly shorter than the winter coat. The winter coat shows a well developed shirtfront, full frill and knickerbockers. All colors are acceptable except pointed patterns and the varieties chocolate, cinnamon, lilac, fawn. Any amount of white is permitted. Any crossing with other breeds prohibited. General: The Siberian cat is a large, strong cat which takes 5 years to mature. The Siberian females weigh less than the males. They are extremely agile and great leapers. Their muscles are mighty, outstanding and powerful. The back is long and very slightly curved or arched, but appears horizontal when in motion. Convex muscular waist and round, compact belly develop with age. The hind legs, when straightened, are slightly longer than the forelegs. The paws are round, big and quite powerful. The overall appearance should be one of great strength, force and size with an excellent physical condition and alertness; the facial expression is quite sweet. The general impression is one of roundness and circles, rather than the rectangles and triangles of similar breeds. Head: The Siberian cat's head is a modified wedge of medium size with rounded contours, broader at the skull and narrowing slightly to a full rounded muzzle with well-rounded chin. There may be a slight muzzle curvature, but the transition between the side of the head and the muzzle is gentle and inconspicuous. The cheek bones are neither high set nor prominent. There should be a good distance between the ears and eyes. The top of the head is flat, with a slight nose curvature before the tip. The neck is medium-long, rounded, substantial, and well muscled. Tail: The Siberian cat's tail is medium in length, wide at the base, blunt at the tip without ticking or kinks, evenly and thickly furnished. Ears: The Siberian cat's ears are medium-large, wide and set as much on the sides of the head as on the top; ideal position is 1 to 1-1/2 ear width apart. The tips are rounded and the ear tilts forward. Lynx tipping is desirable. Hair over the back of the ears is short and thin; from the middle of the ear, the furnishings become longer and cover the base completely. Eyes: The Siberian cat's eyes are large, almost round and set wide with the outer corner slightly angled toward the lower base of the ear. There is no relationship between eye color and coat color/pattern, however, the typical adult color is yellow-green. Coat: The Siberian cat is a moderately long to longhaired cat, with hair on the shoulder blades and lower part of the chest being thick and slightly shorter. There should be an abundant ruff setting off the large, impressive head. There is a tight undercoat, thicker in cold weather. Allow for warm weather coats. The coat gives the impression of lacquer and oil when ungroomed. The hair may thicken to curls on the belly and britches, but a wavy coat is not characteristic. The skin may have a bluish cast. Clear strong colors and patterns desirable, but are secondary to type. 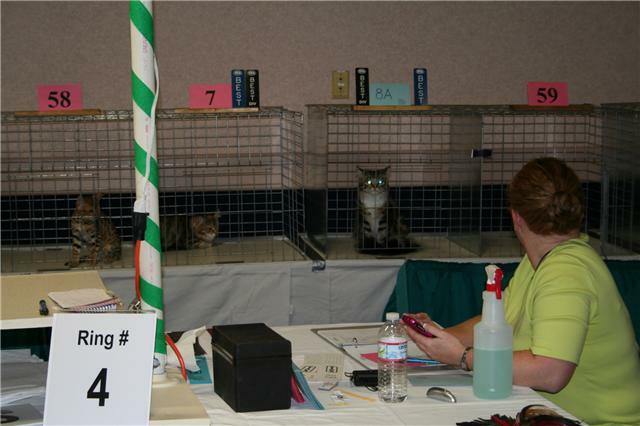 Penalize: Adult Siberian cats not having substantial weight. Straight profile. Narrow or fox-like muzzle. Almond shaped eyes. Very long legs. Colorpoints: Russians have had the colorpoints as a part of their breeding program since records were kept by the various cat fancy clubs in Russia. People had thought that long ago the feral pointed patterned cats and the feral Siberian cats "got together" along the banks of the Neva River in Leningrad ( which is now named St. Petersburg ) in the 1960â€™s. Russian breeders soon noticed the festive pattern of these cats and began incorporating them into their Siberian breeding program. The Russians use the nickname "Neva Masquerade" for this breed- Neva for the river and Masquerade for the coloring. Neva Masquerade is not a separate class of the Siberians but is a Siberian. According to breeders no outcross has ever been used to produce the colorpoint Siberian. They say that being a natural breed of cat anything is possible in any line of the breed. Three breeders in United States soon noticed that there were not any of the colorpoints here. When the kittens arrived controversy began on acceptance of the colorpoint. After much debate the colorpoints are now an accepted part of the Siberian standard in the United States. Many other countries still do not allow the colorpoints into their breed standards of acceptance. Personality: The Siberian cats have a wonderful dog like purrrrrrrsonality and they are very affectionate! A Siberian cat never runs off and hides under a chair or bed when seeing a stranger. Unlike many breeds this breed will come over and greet the stranger. They are very intelligent and learn quickly and even "problem solve" to get what they want. They love to be spoken to and will come running if called by name. Siberians also have a triple purr and unlike other breeds have a chirping sound when coming up to greet you. They also have a large bushy tail that stands at attention and does a shimmering effect when happy, that may look like they are spraying to some which is not what they are doing. Siberians have a fascination with water, often dropping toys into their water dishes or investigating bathtubs before they dry. This is the ideal lap cat that is calm and yet very active at playtime.